Present: Luana Baumann, Stefanie Ibendorf-Schmidt, Karin Jung, Edna Krüger, Angela Pick, Gerlinde Albrecht, Silke Rohr, Jean Everett, Margret Rockwitz, Andrea Kandler, Renée Haumann, Gabi Semmel. This is the first time that most of Roselle’s Hula students in Germany came together to continue learning the culture and dances of Hawaii. 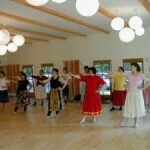 New dances were taught and old dances were intensively reviewed and corrections were made. In some cases some additional dance-steps were created to adjust to the rhythm of the music version. One dance we learned is beating the Ipu at the same time as the normal steps and hip movements. At first it felt like its impossible to learn all these movements, but with Roselle’s patience and method, ‘there is nothing impossible in Hula’. 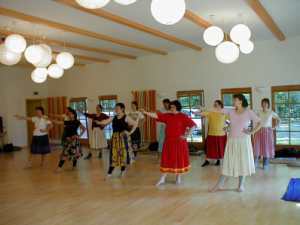 Learned the entry dance (KAI). A dance that brings the dancers in front of the audience. A very impressive entry dance accompanied by chanting and Ipu. An old German song was sung and danced in Hula style as a present to Roselle and Jim. Not only that, we also do the hula hand gestures for the German song that was composed by other Hula sisters during their visit to Hawaii last year. A part of every dance is ‘to kahea’ (announcing the next verse). Some of us did very good to ‘Kahea’, like Jean from Hamburg. We have learned the right way and timing when to do the ‘Kahea’ and also tune and pronunciation too. Some chants and songs were reviewed and some tunes corrected. Hawaiian culture and practices were taught. We discussed and learned how to implement or initiate them (such as: respect – honesty – sharing – trust and more). To strengthen our Hula group there are not only the dances, songs or activities to share, but behind these activities there is more to learn, practice and share. After dinner Andrea and Stefanie taught some ladies how to play Ukulele or Guitar. Luana and Silke played the music instruments with them too. A very exciting part during the workshop. We Hula sisters from Berlin showed and shared the technique on how to make Leis in different ways, raffia and shell Kupe’e’s. We shared our activities (previous and past). Jim introduced a new way of tying the Raffia grass to make it more ‘bushy’ (we will show his method). Other hula sisters shared their experience growing their own gourd, treating and drying them until it becomes an IPU. The best and the most challenging part of the workshop program. It is the most CHALLENGING because we have to show what we have learned and perform the best we can. Roselle announced the ‘Hula Concert’ to be held next year on the 24th of July in Heidelberg. For this event a few Hula Halaus from Hawai’i will be flying to Germany. Roselle’s students in Germany will also be participating in this event. We will be performing a set of Kahiko and Auna dances. 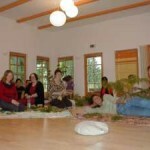 This workshop was very effective in improving the skills of Hula dancing – getting to know other hula-sisters. 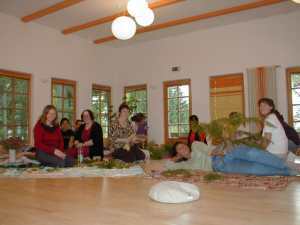 The fact that it was an in-house – 6 days activity the intensiveness of the whole activity binds even more and stronger between the hula sisters. Its was FUN and the HULA spirit was overwhelming.